I have learned over the years, I like things for my kids that are either useful or toys that can spur on imaginative play. Here is a list of things we either have and love or are wishing for. 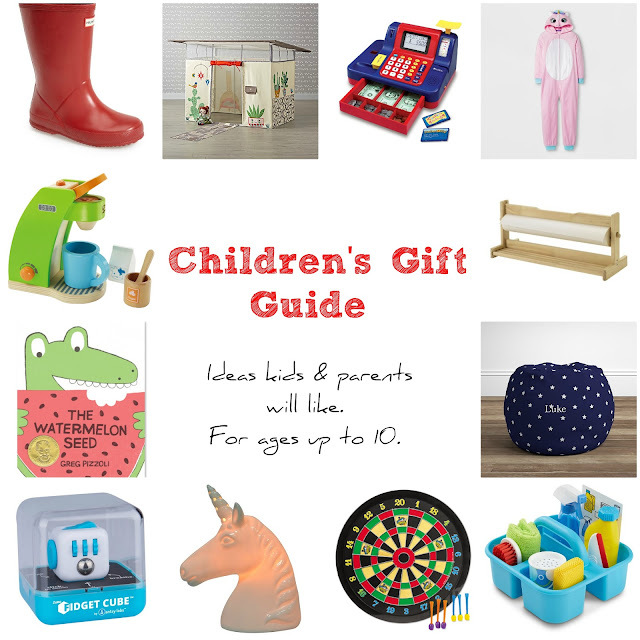 It covers a wide range of gift ideas for kids all the way up to age 10. These presents are all over the price spectrum, many of them very budget friendly. Books are always a good idea. Perhaps The Watermelon Seed board book or Little Dinos Don't Bite for the little one in your life. How To Train A Train or Diary of A Fly for the slightly older one. And Nancy Clancy, Captain Underpants or Diary of A Wimpy Kid for the older reader. In fact, Captain Underpants the movie will make the whole family laugh. So will classics like Home Alone and Ernest Goes to Camp. This wood coffee maker is cool. What kid doesn't want to make their own candy? This diy charm bracelet kit was a favorite of Isla's. This cash register is a huge hit in our home. Melissa & Doug dress up outfits are awesome too. This cleaning set is played with by my kids and their friends all the time. This astronaut helmet is a favorite in our home. What baby wouldn't look cute in this beanie? And what mom wouldn't be happy if her kid was gifted a pair of hunter rain boots? Playhouses, especially ones that easily come apart for storage, are always a good idea. How about a fun sleep suit for the little girl in your life? How about a magnetic dartboard for the older kid in your life? And let us not forget fidget cubes. Those are all the rage right now. Or even something for their room, like a cool nightlight. Or perhaps a safe for their prized posessions. Or even a comfy bean bag chair. Craft items are always a win. This paper roll is cheap and cool. And these dot paints are fun. If you are going for something unique, a venus fly trap is sure to intrigue them. And if all else fails, games are always a winner and the classics are still a big hit - monopoly, battleship and scrabble junior.